To get used to Haskell, I wrote a little program using the Diagrams package which generates 100 random dots (larger dots are more likely to be in the center). Is the program well structured with respect to the IO monad and the random values (see types for randomDot and randomDots)? Should I organize the code differently to keep more code out of the IO monad? 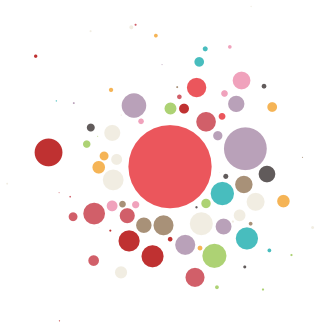 -- |Generate a single dot with random location, radius, and color. Nitpicks: I'd put tooClose before randomDots so that the functions are in logical order, but that's just a matter of personal preferences. Otherwise I also quite liked the code. it checks each generated dot with all previously generated ones. -- | Runs a monadic action while its result satisfies a given predicate. I really like your solution. The only note I would make is that RVar has an Applicative instance which makes writing code in a declarative style a lot easier. It's entirely a matter of taste as to which one you prefer. Not the answer you're looking for? Browse other questions tagged haskell random graphics monads or ask your own question.